The late spring and early summer hiring season is in full swing, and as the economy steadily improves, more candidates are jumping into the pool of available positions. Here's how to craft a resume that's sure to rise above the rest. Don't neglect your cover letter, as it's often a recruiter or hiring manager's first impression of you, before they even look at your resume, says James Stanger, senior director, product development, CompTIA. "Cover letters and resumes are the first impression hiring managers and recruiters have of you, so make sure they're solid and professional. This is not the place to be cute with formatting, font or design. Keep it simple and clean so the emphasis will be on the content. Use a font like an Arial which is pretty standard and easy to read; not a swirly, cursive font that's going to annoy anyone who's reading," he says. Another great choice for resumes is Helvetica, according to a recent report from Bloomberg. Read more about creating a great cover letter. Networking and referrals from current employees are how many businesses source their best hires, so leverage your network to the hilt, says Alyssa Gelbard, CEO and founder of Resume Strategists. The beginning of your cover letter is an appropriate place to mention if you're sending your resume and application at the request of someone at the company, Gelbard says, or if you're a friend or former colleague of an employee. "You should lead with this information; this gets noticed quickly by whoever's reading your letter, and will help you stand out," says Gelbard. Format is more important than you think. Make sure your format is clean, clear, concise and precise so that the content of your resume can shine through. "The format isn't by any means the most important part of a resume, but spend a lot of time to get this part right. If you don't, you'll draw attention to your resume for all the wrong reasons," says Stanger. There are probably thousands of free resume templates available both within your existing business software suite and available on the Web; use them, says Stanger. Formatting is also the key to getting your resume past an automated applicant tracking system (ATS) or a resume parser that scans these documents for specific keywords, phrases and skills. ATS use a resume-filtering module that scans and grades resumes on a scale of 0 to 100, with points given for each match in keywords and terms that happens between a resume and a job posting, says Rick Gillis, an author, career coach, job search consultant and speaker. 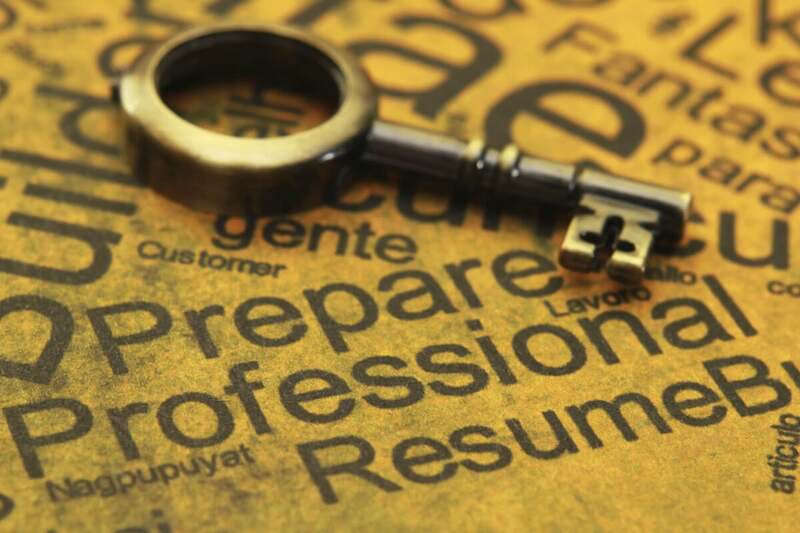 Because many recruiters and hiring managers are strapped for time, they'll often set the software to scan only the first page of your resume, so it's critical that all relevant keywords appear on that first page, according to Gillis. Gillis recommends that applicants keep a running list of keywords relevant to the jobs you're seeking, including any jargon, lingo and industry-specific language, and add to those the keywords from the job to which you're applying, and place them in 8-point font at the bottom of your resume. "If the terms are not already on your resume, you must artificially insert them. The best way to do this is putting them all in a separate section at the bottom of the resume. Remember, you're not doing this for the humans, you're doing this for the machines that will 'see' your resume first," she says. Always use language from the job description. "When a company posts a job description, they're saying, 'Here's what we need,' so you want to use that same language to be relevant when you're explaining why you're an ideal candidate for the position," Gelbard says. Using the same language and keywords from the job description doesn't just help humans reading your resume, it also helps if your application is initially processed by an applicant tracking system or a resume parser as mentioned before, says Stanger. You also should be as specific as possible when describing your responsibilities at current and previous jobs, says Tom Leung, CEO of anonymous job search platform Poachable. "We see a lot of candidates assuming that hiring managers and recruiters automatically understand what they do based on their job title. They think, 'Well, I'm an online marketing manager, a lot of what I do is self-explanatory,' but that is so often not the case. …As best you can, spell it out," Leung says. Recruiters need to know things like, what platforms are you familiar with? What was your budget? What kinds of improvements did you make to internal processes? How your contribution increased the ROI on certain projects? What role did you generally play; were you a team leader or an individual contributor? If you're applying for a large number of jobs at the same time, customizing every resume might not be feasible, time-wise, but you should at least narrow your top 10 and make sure those resumes are very finely tuned. That kind of attention to detail sends a clear message to recruiters and hiring managers that you're serious about the position and have put time and effort into landing that role. "Recruiters are looking for any kind of easy out so they can say no and move onto the next candidate. Putting time, effort and thought into customization not only highlights how perfect you are for a specific job, but it says 'I not only have taken the time to customize these documents, I've taken the time to research, explore and understand your company, your business and exactly what the role is; and I'd be a great fit,'" he says. Another thing recruiters and hiring managers love to see on resumes are hard numbers that prove you've made fundamental, positive changes at the companies you've worked for. That can include adoption statistics, sales figures, budget management, revenue increases and the like, according to Leung. "Recruiters and hiring managers will be swayed by your provable value demonstrated in these numbers," Leung says. This makes a more impactful presentation than just listing your responsibilities and tasks. Focus on the accomplishments and achievements in your roles rather than the mundane things you did on the daily. Finally, do some research on the general work environment and culture of the company you're looking at and determine what soft skills and values you share. Then, incorporate your own achievements in these areas into the descriptions of your current and previous roles. "Use examples of where you've used teamwork, negotiation skills, team-building, communication and other interpersonal skills in your day-to-day work. Don't expand your resume to a novel, of course, but these skills and the narratives behind them are just as important as technical skills," Leung says, "You're creating a picture of yourself as a well-rounded employee who can initiate dynamic change, make a positive impact and drive the organization in new, fulfilling directions.". With the spring and summer hiring frenzy in full swing, these tips will help craft your resume into a powerful document that's sure to catch the eye of recruiters and hiring managers and land you that next key role in your career.